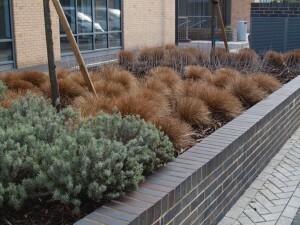 We are very pleased to see the planting at New Capital Quay looking well-maintained and neat even during the winter months. During a recent trip to Greenwich we dropped by to see the landscape scheme that we detailed for construction interested to see how the planting had fared a year after completion. Our designs concentrated on broad sweeps of a single species in contrasting bands, a technique which creates maximum effect for a large-scale site like this one. The plants we selected provide a year-round low maintenance scheme designed to withstand the exposed dockside conditions and are proof that you can achieve great results with tough, cost effective plants. The silver leaves of the Santolinia in particular look fabulous against the brassy clumps of Pheasant’s Tail Grass which in turn picks up the warm yellow tones of the architectural brickwork in the background. There are so many variables with planting design; aesthetics, time, space, water, soil and exposure so going back to a site to see how things have fared is essential to gain valuable feedback ready to apply to our next scheme.